on W. Grand Blvd. near Third, enroute to the DSR's Wyoming Terminal loop at Wyoming and Michigan. 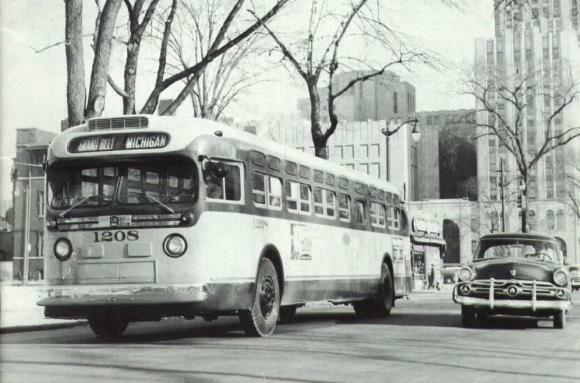 route--and for a few years even as a bus route--never traveled along the Boulevard. business on December 31, 1931.
between 1933 and 1934, some trips were extended via West Grand Blvd. to Tireman and Wyoming. were impressive, with 1 minute headways during peak hours and 5 minute headways during the base. primarily assigned to the route during that time, somewhat justifying the short headways. via Grand Boulevard to Jefferson, to Helen. Certain A.M. coaches operate to Grand River Avenue." basically remained unchanged when the two routes were combined. electronic computerized signs during the late-1980's, the route name had returned to Grand Belt. minutes during the A.M. and P.M. periods, and 10 minutes for the base. The new "king-size"
even needed for A.M. service. DDOT took-over operations in 1974, headways had already increased to 10 minutes during the A.M.
and P.M. hours, 20 minutes for the base, and 30 minutes during evening hours. evening. Weekday headways average 45 minutes. Township. The 11.3 mile looping roadway, which today circles the central city, covers an area of 213 acres of land. information courtesy of "The city of Detroit, Michigan, 1701-1922" by Clarence Burton, William Stocking and Gordon Miller (1922--S. J.